The arrival of spring brings with it one of the finest and most versatile ingredients our woodlands have to offer: wild garlic. 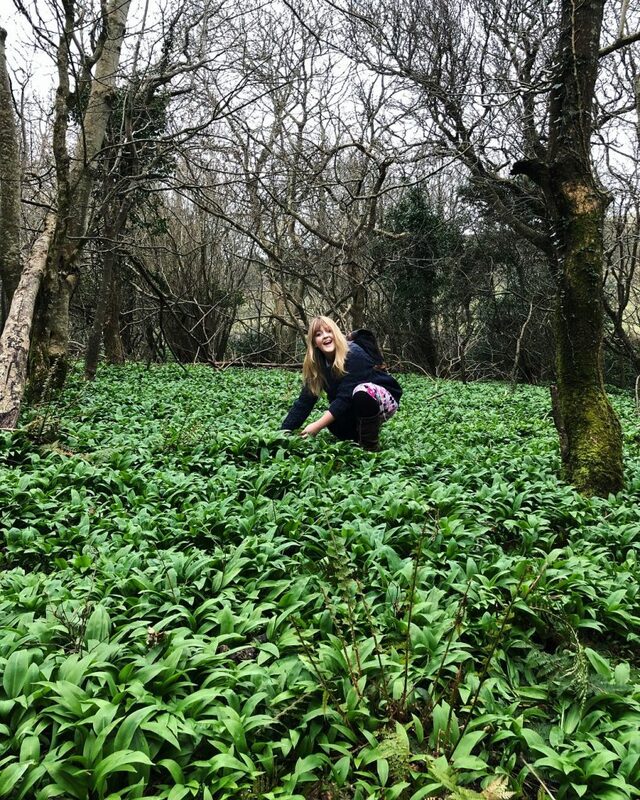 Also known as wood garlic, ramps, or – in a particularly romantic Hardy-esque fashion – “ramsons”, wild garlic is native to most of Europe, having grown in our woodlands for centuries. 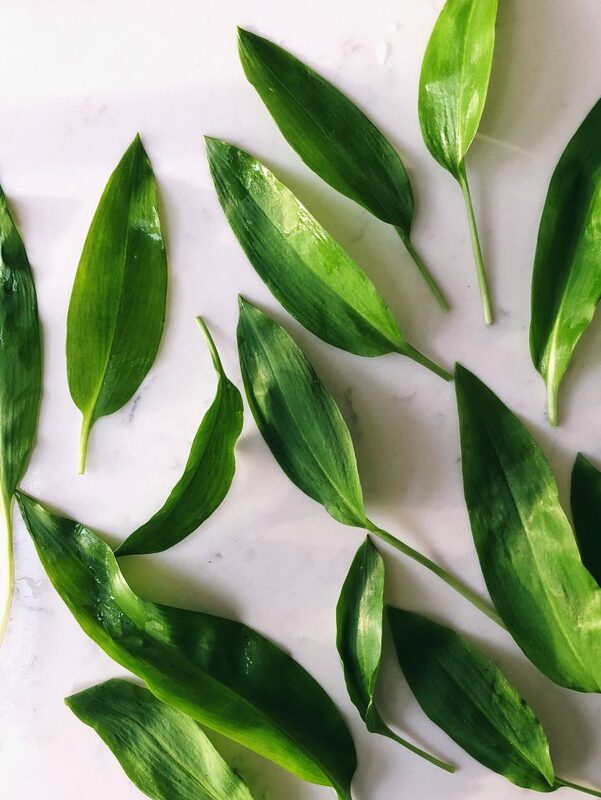 Being high-end restaurant-fashionable these days, the wild garlic found at farmers markets and Notting Hill grocers is horribly expensive to buy. Which is madness, because take a walk in the woods… and it’s totally free, growing en masse under our trees. See? Despite its strong scent, wild garlic’s flavour is actually far more mellow than everyday garlic bulbs, adding a gentle, deep note to dishes. Chopped into salads, blitzed into pesto, folded into scrambled eggs and homemade mayonnaise, added to risotto, or simply cooked in place of spinach it’s no wonder this versatile ingredient has become so popular. P.S. There is one more name for wild garlic… Bear garlic. Apparently the loveable kill-you-with-a-single-swipe-of-the-paw fellas are as partial to wild garlic as I am, munching away on the leaves after hibernation to kick-start their digestion. Though the UK isn’t exactly inundated with bears, I’d keep a marmalade sandwich in your pocket just in cases. Come springtime, you’re likely to find wild garlic growing rampant beneath the dappled canopy of deciduous woodland. Tall oaks, swaying beech and elm, sprawling branches of hazel hornbeam and ash – these are the classic woods of National Trust trails, stately homes and Winnie The Pooh. Enjoying cool damp soil and a gentle slope, wild garlic thrives in managed, not-too-dense woodland where the leaves let in sunshine between their branches. Wooded riverbanks and banks are another prime wild-garlic-finding spot. I even found it in a graveyard once, but that seemed rude. You will smell wild garlic before spotting it. Where one wild garlic plant grows, so hundreds follow – great carpets of the stuff rollicking across the woodland floor, up to 50cm tall. Smell aside, wild garlic is easy to spot. Long pointed leaves of vibrant green, slightly fatter in the middle before tapering to a point. Towards the end of the season, wild garlic sends up lovely scruffy allium-like pom pom flowers. Hurry… these white 6-petalled blooms signify the end of wild garlic’s growing season. On the upside, you can eat the flowers too. Lilly Of The Valley, which is poisonous. Growing in a similarly rampant carpet-like fashion, its leaves look very similar to wild garlic leaves. Luckily, there’s an easy and virtually foolproof way to tell the difference… Lilly Of The Valley’s leaves don’t smell of garlic. Crush one between your fingers and, if that distinctive garlicky-onion smell doesn’t immediately hit you in the nose, throw it away. When in flower it’s easy to tell, as they send up pretty little white bell-shaped flowers from a straight central stalk. Wild garlic leaves are at their best and strongest from March to May, before the plants flower. Harvest leaves, stems and flowers using scissors or a sharp knife so as not to damage the plant, leaving the bulb in the ground to grow again next year. 3-5 days if kept in the fridge. Wash before using. 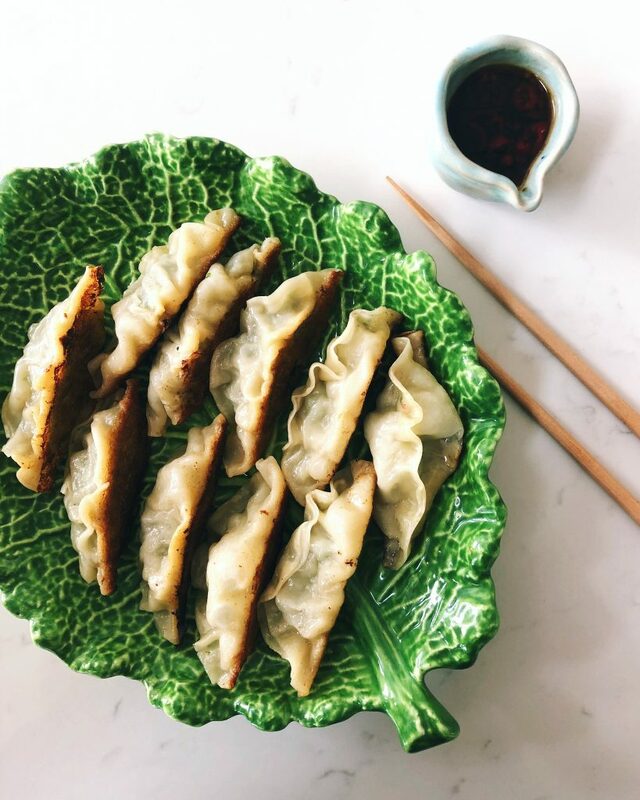 As a certified enthusiast of dumplings in all their guises, imagine my delighted dim sum surprise when I realised how easy they are to make at home. 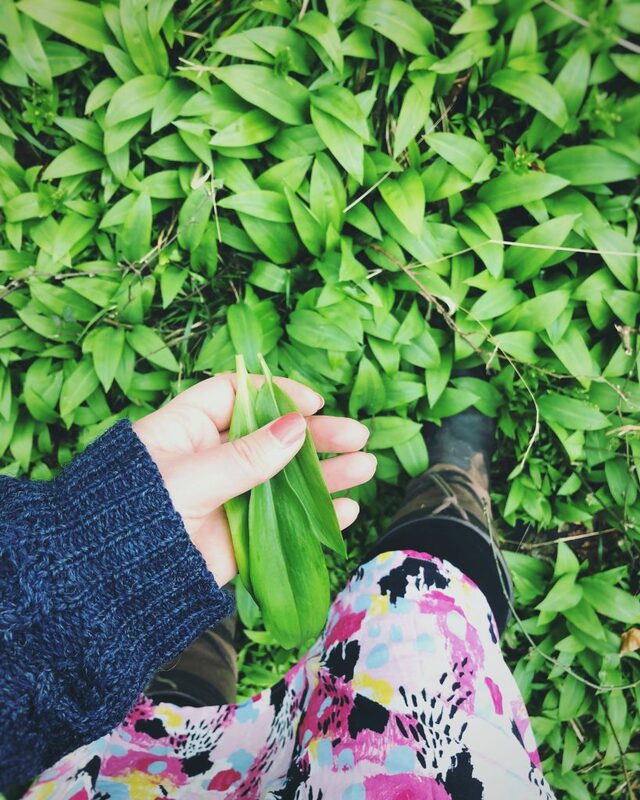 Freshly picked wild garlic adds both a mellow spring freshness, and a lovely dash of colour to the plate. These are the Japanese gyoza members of the dumpling family. I’m deploying the “no need for a fiddly steamer” frying pan method here: so much simpler than anything else I’ve tried, with no need to buy new kitchen equipment and the added Brucey bonus of crispy golden dumpling bottoms to boot. We’ll be using ready-made wonton/ dumpling wrappers, available from your nearest Chinese supermarket. (Well worth a slightly terrifying trip to the local industrial estate, I say.) You’ll need a blender to make the filling. Tip your prawns, wild garlic, chilli, ginger, soy sauce and sesame oil into a blender and blitz to a paste. Just towards the end, add the water chestnuts and pulse for a few seconds – so that they’re mixed in, but still have texture. Then it’s on to the gyoza assembly line. 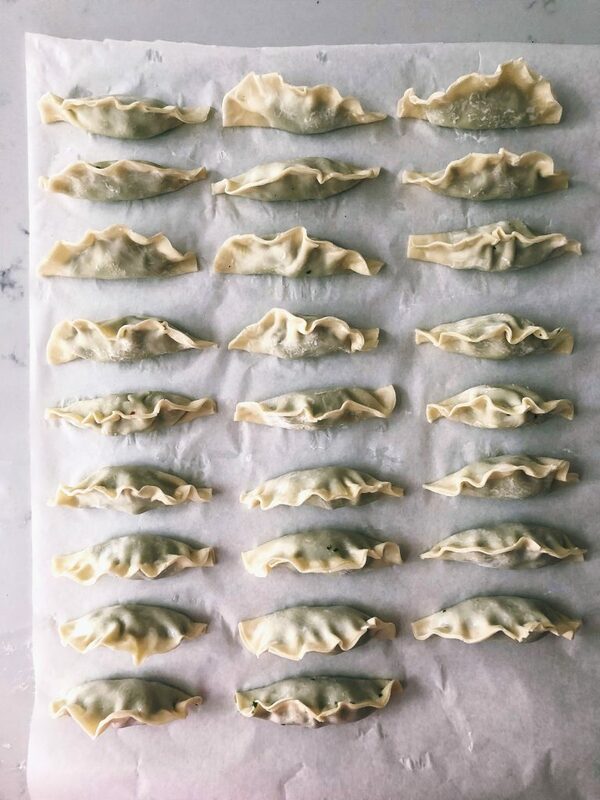 Unlike the slickly automated process of, say, car manufacture, gyoza production is a far more delicate, fiddly, and imperfect. It also takes AGES so rope in some hapless fools/ friends to help. Keep the dumpling wrappers covered with a damp cloth/ kitchen towel until needed to keep them from drying out. Prepare a clean flat surface with baking paper, place a cold bowl of water within arm’s reach, then carefully peel away a wrapper and rest it in the palm of your hand. Dip your finger into the water, then run it around the edge of the wrapper in to moisten. Spoon 1 heaped teaspoon of mixture into the middle (don’t overfill or it will be a nightmare to seal). 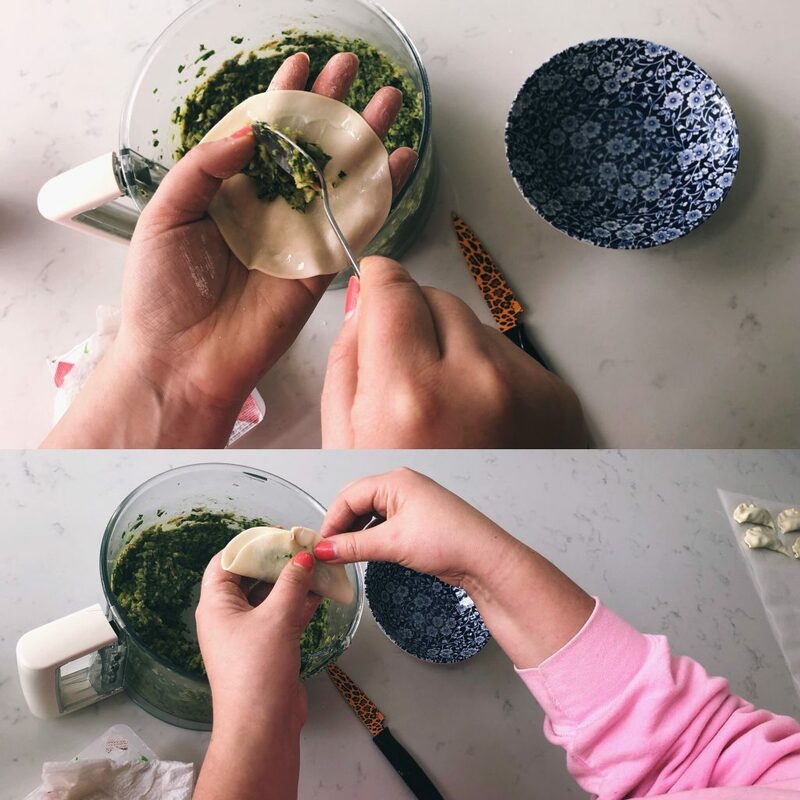 To seal, dip your fingers into the water again, then gently squeeze together the edges of the dumpling wrappers into a sort of neat-ish fan/ tiny Oriental Cornish Pasty shape. Place them fat-bottom down Repeat 29 times. I find a glass of wine helps proceedings. Place a large non-stick frying pan over a medium flame, adding a splash of sesame oil. When hot, carefully add a batch of dumplings, flat little bottoms down, making sure none of them touch. Cook until crisp and golden underneath. Now for the clever bit. Using a jug, pour tap water straight into the frying pan, to a depth of roughly 1cm. Do this quickly and stand back as it’s likely to hiss like a pissed-off swan. Whack up the heat and cover with a lid to bring to the boil. Once boiling, reduce the heat back down to medium and, lid still on, let them steam for roughly 8 minutes. Quickly mix together your dipping sauce and set to one side. When 8 minutes is up, remove the lid and cook off the last of the water so that your gyozas’ bottoms crisp up again if needed. Serve right away on a nice plate, dipping profusely while dramatically gesticulating with your chopsticks.